Nupe carving is a rich tradition handed down by generations of men who learn the craft from their fathers, relatives or master carvers. 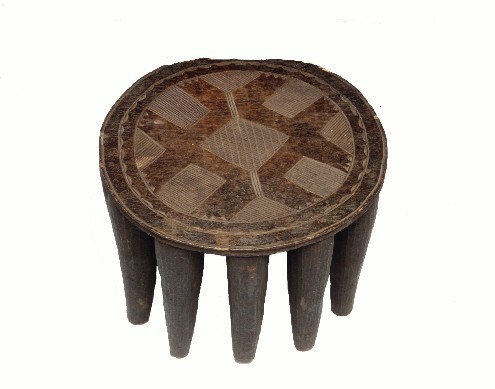 Though styles and symbolism vary somewhat, some are like the stool exhibited here: eleven-legged and made from a single piece of wood topped with an incised design. The design often includes a diamond shape symbolizing the four days that make up a week in the Nupe calendar. Though sculpted by the men in the group, the stools are used by women while cooking and spinning (the Nupe also are well-known for their textiles). The stools have social value because parents present this type of stool to a daughter as a sign recognizing her as a mature woman.